417 Pet Sitting is the product of years of volunteering time to rescue and having a passion for caring for animals. This company started out with one woman walking a friend’s dog on Friday afternoons. What started out as a little dog walk on Friday, thanks to referrals, has turned into an amazing career path! Pets are a part of the family – they are our fur-kids. They make us laugh, they love us unconditionally and they are always there to make us feel better. With that in mind 417 Pet Sitting was born. We are licensed, bonded and insured professional pet sitters with a passion for providing the utmost care for your pets. We know and understand that while you are away on business or vacation you want your pets to be treated with as much love as you would give them if you were at home. It can be stressful on our pets when we leave them for a few days; however, it has been shown that leaving your pets at home where they have familiar surroundings and smells can greatly reduce the anxiety of having their family away. 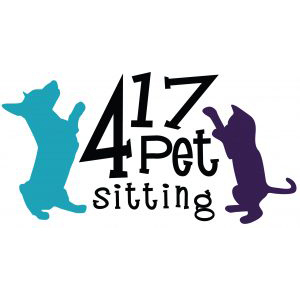 All of us at 417 Pet Sitting are animal lovers – we aren’t in this to make a quick buck nor are we corporate people looking to capitalize on pet owners. We want your pets to be safe at home, getting plenty of attention and adhering to their normal routine. We offer an in-home consultation for all of our clients – this is a great opportunity for you to meet your assigned sitter, as well as for the sitter to become familiar with your home and where the supplies are located and of course to begin bonding with your pets. As the owner of 417 Pet Sitting, I keep regular office hours and check voice mail hourly. During peek times of the day (ie feeding times and mid-day) we are busy performing pet sitting duties, but your calls will be returned promptly. We promise to return your call within 24 hours, but we strive to return your call and get your needs met within an hour of your call. We, like most pet sitters request at least two weeks notice, but we are usually able to accommodate an occasional short-notice assignment. At 417 Pet Sitting we strive to give you peace of mind knowing your fur-kids are safe at home with caring professionals.